Brain enhancing nootropic coffees have the potential to take the smart-drug fad mainstream. For millions of people around the world, it feels nearly impossible to focus and begin the work day without a cup of coffee. In America alone, an estimated 64 percent of the population drinks at least one cup each day – according to results of a survey commissioned by the National Coffee Association – which explains why retail coffee is a $36 billion industry. But while the majority of Americans might agree that coffee is an essential part of their daily ritual, the type of coffee they consume varies wildly. From tried-and-true instant coffee to gourmet cold brew, there’s never been a wider array of options to choose from. And now, yet another option is being added to the mix: Nootropic Coffees. A nootropic is a substance that enhances cognition and memory, and facilitates learning. While there is much debate over the merits and long-term safety of nootropics, which are sometimes referred to as “smart drugs,” proponents claim they are useful for boosting productivity and maintaining focus, much in the same way people currently use coffee. This similarity between the effects of coffee and these so-called smart drugs is no coincidence. 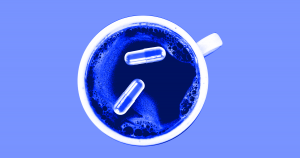 Two of the most popular nootropics are caffeine and L-theanine, both of which can be found in a regular cup of Joe. So it’s no surprise that the nootropic industry sees winning over coffee drinkers as a logical next step. Currently, there are several brands of nootropic coffee on the market boasting a wide variety of cognitive benefits. The makers of Kimera Koffee claim to have created “a special blend” that will “turbocharge your brain.” They’ve combined organic coffee beans from the Dominican Republic with amino acids and nootropics in order to create a “robust” and complex” drink that they say will increase both energy and cognitive function. They also assert that Kimera has no more caffeine than a regular cup of coffee, which is good news for anyone worried about contracting a case of the jitters. The makers of Thinknoo claim to have developed “two naturally-inspired supplements that offer the first holistic approach to enhancing the effects of coffee.” These supplements, known as NooStart and NooReset, are taken with your daily coffee, and at the end of the day, respectively. They are supposed to result in better mental energy and focus, and help eliminate the common coffee side effects such as “the afternoon crash” or over-stimulation. Mastermind’s organic Hyperfocus Coffee contains Yerba Mate, which is supposed to boost mental clarity and energy. The result is “heightened cognitive function” and “unparalleled mental clarity” without a normal coffee crash. Bulletproof Coffee offers many of the same benefits cited by the other companies on this list. However, their organic beans are conveniently pre-ground in order to save time. Their proprietary process optimizes every step of coffee production by minimizing the opportunity for performance-robbing mold toxins to enter. Lucy Jo’s Organic Brainstorm is a low acid coffee created by a family-run certified organic roastery based in Upstate New York. The company claims that each ingredient comes from a single origin, and that no filler beans are used. As a result, this small batch coffee is primarily marketed to coffee drinkers who have health concerns about mass produced brands. At the end of the day, the scientific verdict is still out on whether nootropics offer legitimate benefits to users, or are nothing more than a trendy fad. As such, it’s currently up to consumers to decide if they should buy into the hype. But for anyone who is interested in taking the plunge, the nootropic coffees listed above are a good place to start.